Sizes: 140 L, 160 L, 180 L, 230 L, 250 L XR. The new extended Kailua line sets the standard for modern beginner boards. Stable, durable, and easy to handle, the Kailua range is also hard to outgrow. 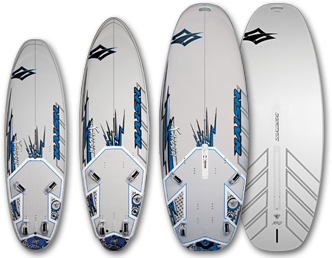 This ultimate school board range is both the ideal choice for beginner level sailors of all weights AND an excellent introduction to the world of planing. The classic Kailua 230 and 180 have retractable daggerboards to facilitate sailing at its most basic level. The Kailua 160 and 140 feature a short twin fin setup that adds stability and maneuverability, letting intermediate sailors experience planing without the more demanding feel of a big single fin. The Kailua Jr. 120 extends the same versatility to kids boards, taking junior sailors from their first steps as a windsurfer to riding in foot straps and harness. The Kailua XR combines the wide Kailua concept with a longer outline for classic gliding performance. This makes it the industry's foremost modern beginner board, and a fun alternative for any sailor simply looking to get on the water in light wind.